Welcome to 2018 lovelies!! I spent most of yesterday reflecting on 2017 (as per my goal planning post) and that included reflecting on LegalLee Blonde. One thing I did was take a look through my RewardStyle account and in so doing I was able to see what the most popular items were of everything I shared with you in 2017! I thought it would be really fun to share with you guys what these most-loved products were. 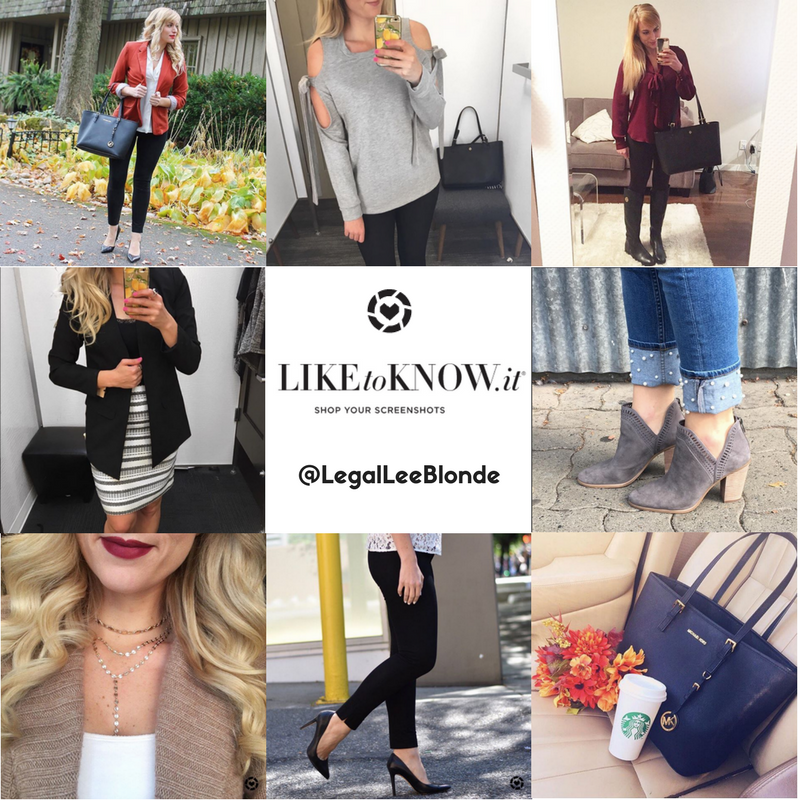 Below are the 8 most-loved items that I shared on LegalLee Blonde in 2017. Some of them are out of stock now (I guess too many of you purchased them haha!) but many are still in stock. For the ones that aren’t I’ve tried to link similar looking items. also super fun to see how you styled the item! Finally, thank you all SO much for your support of LegalLee Blonde. The fact that you trust my opinion on items (enough to buy them) still blows my mind, and is something I appreciate so much and am so grateful for. I will definitely keep sharing my honest opinion with you all in 2018! No surprise here! When I found these under $50 insanely comfortable classic black pumps, I basically screamed it from the rooftops haha. It is definitely no surprise then that so many of you purchased these heels for yourself. (dozens of you did!!!) They are beyond comfortable and perfect for work. They are (sadly!) now only left in one size, but do check back for re-stocks as they did re-stock a couple of times throughout 2017. In the meantime, if you are on the lookout for other comfortable work heels make sure you check out my Guide to Comfortable Heels Post. 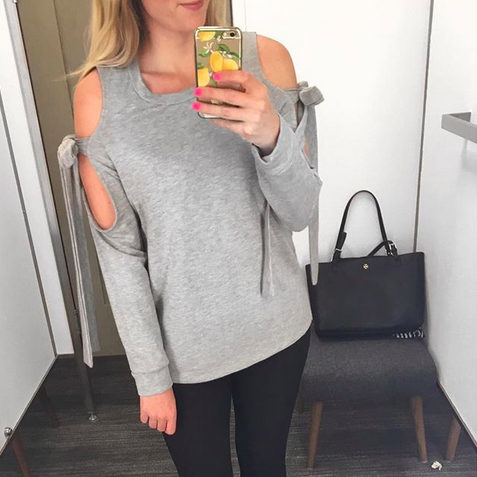 The second most popular item of everything I shared was this cold shoulder tie sweater I shared during the Nordstrom Anniversary sale. The bow tie details on the sweater made me swoon; and apparently it made you guys swoon as well! It is unfortunately sold out completely, BUT, I found a really similar bow tied sweater and it is under $60! These are my hands-down, never fail me, wear-way-too-often leggings. I love these, and apparently many of you do as well! These are still fully in stock and if you haven’t tried a pair yet, I highly recommend you do! 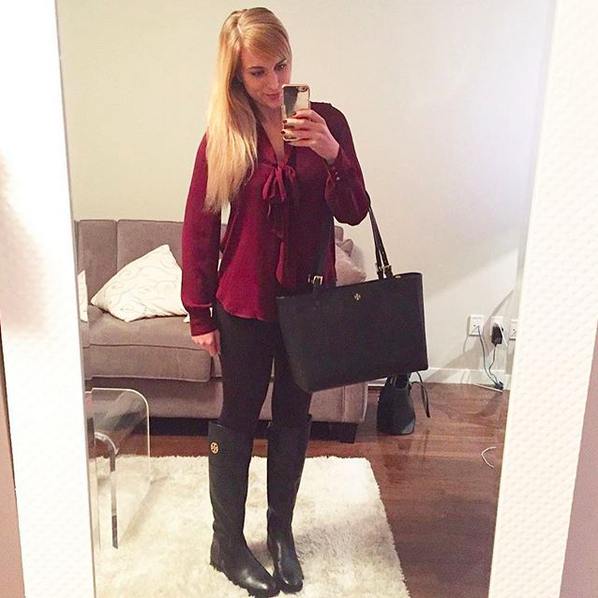 Back to the work wear, this skirt is one I love to wear to the office and it is something you all loved this year! It is sadly sold out, but I will let you know if it ever does come back in stock! I’ll be sure to re-share it on my instagram so you can shop it 🙂 In the meantime if you missed out, but like the look of this skirt, I did find a similar striped pencil skirt. 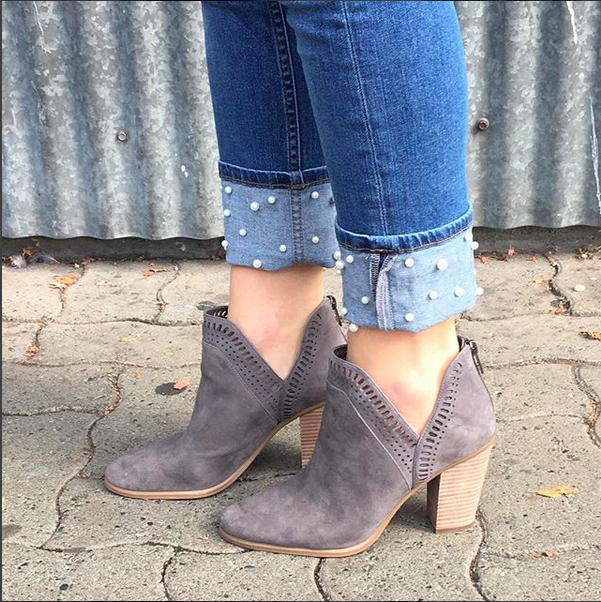 Coming in at #5 are these suede ankle boots by Vince Camuto. I wore these non-stop this fall! These are still fully in stock and now are 20% off! Love it! Given how many times I wore this necklace this past year, I am not at all surprised so many of you got it! 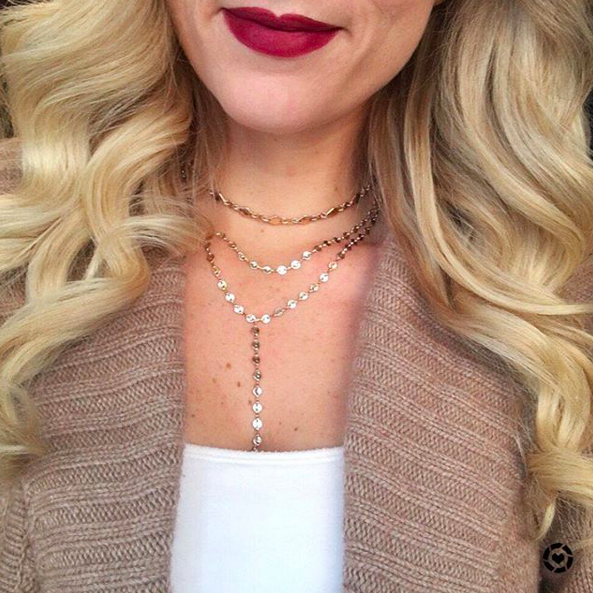 This is still one of my favorite necklaces because I find it really versatile and while it is super trendy, it some how manages to feel classic as well. It is sold out, but I will let you know if it comes back into stock! They also carried it in silver (I’ll let you know if that color comes back in stock as well) and I wish I got the silver one as well! If you have the silver please tag me in a photo so I can see what the silver looks like on a real person!! Like the Payless pumps, I was not surprised to see these heels made the list of your most loved items! These are the heels I wear almost every day (they are in so many of my instagram posts!) They are still fully in stock and come in other colors as well! 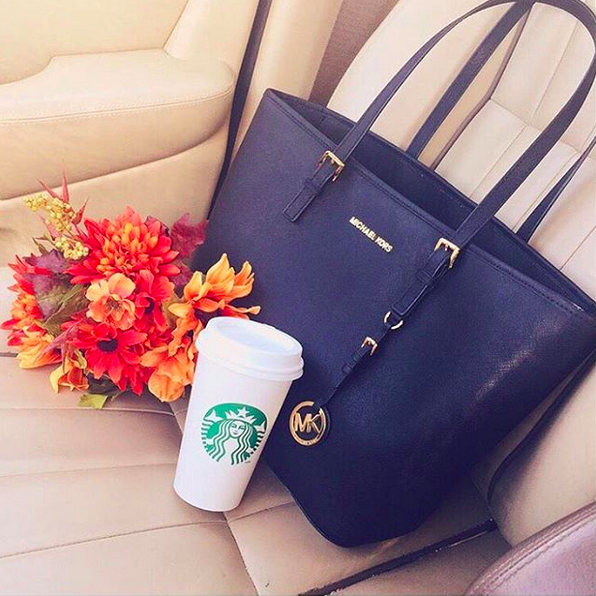 This handbag has been a staple in my closet since 2014, and while I moved more towards my Tory Burch tote as my everyday bag this year, I do still love this Michael Kors handbag for it’s practicality. The zipper close makes it the only purse I will use when I travel! I love it. It is still in stock so you can grab one for yourself if you want! It also comes in like 14 billion colors, so there is one for every taste. So there you have it! Your most-loved products of 2017. Did you get any of these? Anything you thought would make this list but didn’t? Let me know in the comments below! "2018 Goal Planning ( aka. Succeeding Without Making “New Year’s Resolutions”)"
"Easy Whole30 Lunch Idea: Powerhouse Salad with Lemon Tahini Dressing"